If you would like to know how to lay parquet flooring, you can find many information about laying process on our web site. Beside laying information, you can also find information about maintenance of parquet flooring. Parquet flooring installation can be done with two methods. Floating method is usually used for installation of prevarnished parquet flooring. This installation method requires use of good quality underlayment which ensures stability and protection of parquet flooring. Gluing installation method is a classic method which is used for laying solid wood parquet flooring. This installation method offers the best stability to flooring. When you are buying new parquet flooring, you have to decide among many different characteristics of parquet. 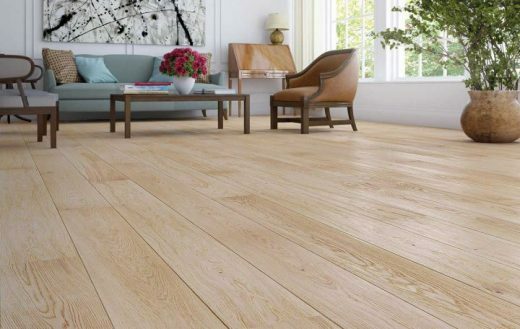 Beside choosing colour, wood species, surface texture and finish, thickness and size of planks, you also have an option of choosing flooring which is suitable or not suitable for installation on floors with underfloor heating. If you have underfloor heating, you have to buy suitable flooring. Heating tubes have to be installed on the correct depth to ensure proper distribution of heat. If underfloor heating is not installed correctly, gaps can start to occur due to overheating. Installing parquet flooring is not a simple task. We strongly advise you to hire professionals to do the installation job. Professionals will install parquet flooring in short time because they have many experiences with laying all kinds of flooring. They use professional tools and materials for installation which give better and long lasting results. Before laying parquet, majority of building work has to be finished. There are only few tasks that can be performed after laying flooring. When laying parquet flooring some basic rules have to be followed. Room temperature has to be 15-18°C, ideal humidity is 50-60%. In these conditions, parquet flooring installation is ideal. Surface on which flooring will be installed has to be properly prepared. It has to be clean, dry and levelled. Before laying planks, you have to decide on pattern for your parquet flooring. Then glue is applied on subfloor and planks are laid. After laying all planks, parquet has to be sanded. When sanding is done, surface of parquet flooring has to be lacquered or oiled. Lacquered parquet needs to be cleaned with special cleaner after it has been installed. That way protective layer is created which has to be renewed at least once a year. Complete renovation of installed parquet flooring has to be done once every decade. Oiled parquet flooring also has to be cleaned after installation with special cleaning agent. Protective layer work against small scratches and stains. Parquet flooring can be installed in different patterns. Most common patterns are herringbone, basketwave, brick, chevron and hexagon. Herringbone pattern is usually installed in bigger rooms. It is made from rectangular parquet tiles which lay together at 90° angle. Laying tiles in beautiful zig zag pattern looks even more stunning if more than one colour is used in a pattern. Herringbone pattern can be installed in single or double rows. Chevrone is very similar pattern to herringbone. Difference between them is in a shape of installed parquet tiles. Tiles which are used for chevron pattern are rectangular and they are cut at an angle to create more arrow shape zig zag pattern. Basketwave pattern is created with parquet tiles which are laid together horizontally and vertically. It can be laid parallel or diagonal to walls. Brick pattern is very beautiful when bigger parquet flooring planks are used. If you want to achieve contemporary look of your home, installation of brick pattern is the right choice. Hexagon pattern is very complicated to create. Parquet tiles are laying in different directions to achieve hexagonal shapes. Different colours used in one pattern give stunning look. Laying complexed patterns add higher value to your home. We offer high quality parquet flooring in light, medium and dark colours. All colours are available in many nuances from golden, silver to reddish. You can choose among 480 different options of parquet flooring. Light coloured parquet flooring is usually installed in rooms which do not have sufficient lighting from natural or artificial source. It also brightens rooms and creates optical illusion of bigger rooms. Light parquet flooring looks great if it is harmonized with light furniture and light coloured walls. Light rooms have peaceful and tranquil feel which makes them suitable for relaxing or meditating. Light parquet flooring can also be well harmonized with dark furniture. Contrast that is created is very appealing and can be used to create traditional or contemporary look of rooms. Dark parquet flooring is recommended for rooms which have plenty of natural or artificial light. Dark flooring can be combined with light furniture and light coloured walls. Medium colours of parquet flooring are very versatile and can be harmonized with all colours of furniture.